The following data is derived from trading activity on the Tradeweb European-listed ETF platform. The first three months of 2016 proved to be record breaking for the Tradeweb European-listed ETF marketplace, with total traded volume reaching €32,875 billion, up €3,770 billion from the previous quarter. In March, the overall traded notional amounted to €10,740 billion. Equity-based instruments saw net selling for the third consecutive month. In contrast, “buys” in fixed income ETFs outperformed “sells” by 12 percentage points. Activity in the asset class accounted for 42% of the platform’s overall traded volume, beating the 12-month rolling average by 12 percentage points. On March 10, the European Central Bank announced a new set of stimulus measures, including expanded monthly asset purchases, which will now extend to euro-based non-bank corporate bonds. More than €1,240 billion in notional was traded in corporate bond ETFs during the month, while there was renewed interest in emerging market bond funds. The latter saw their traded volume surpass €600 million, of which 85% was attributed to “buys”. Half of the ten most-heavily traded ETFs in March offer exposure to fixed income assets. 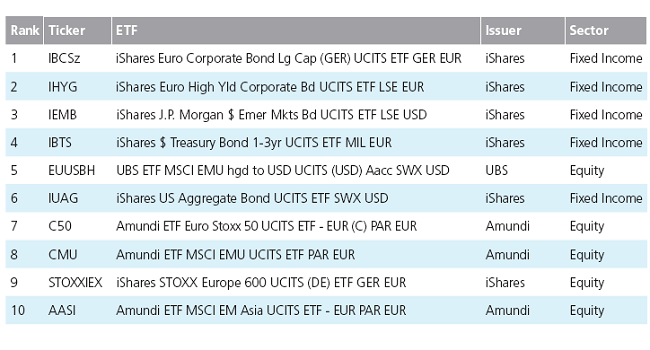 The iShares Euro Corporate Bond Large Cap UCITS ETF, which tracks the performance of an index composed of large and liquid euro-denominated investment grade corporate bonds, was ranked first. In second place, the iShares Euro High Yield Corporate Bond UCITS ETF was also the top fund by traded volume in Q1 2016.